"So... how 'bout them banks in the Philadelphia Bank Index, huh???" or: "Did you see BKX today? Wowzers!" You'll find their eyes rapidly glaze over (and sometimes they suddenly remember they have an appointment to get to) if you attempt to use random factoids about BKX as "ice-breakers" at dinner parties. Believe me, I've tried. Anyway, the chart below is a performance comparison chart of BKX, the S&P 500 (SPX), and the Dow Jones Industrial Average (INDU), going back to the 2009 low. SPX and INDU have performed similarly, while we can see BKX has pretty consistently led the broad market higher since '09 -- except in 2011, when BKX peaked with a lower high and led the broad market down into the mini-crash. 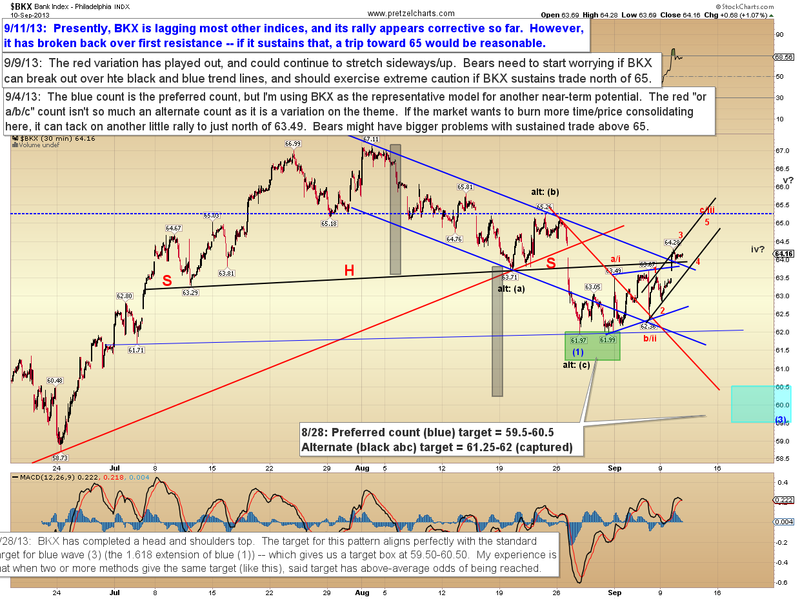 So my theory is if BKX starts making lower highs again, then trouble is probably brewing. 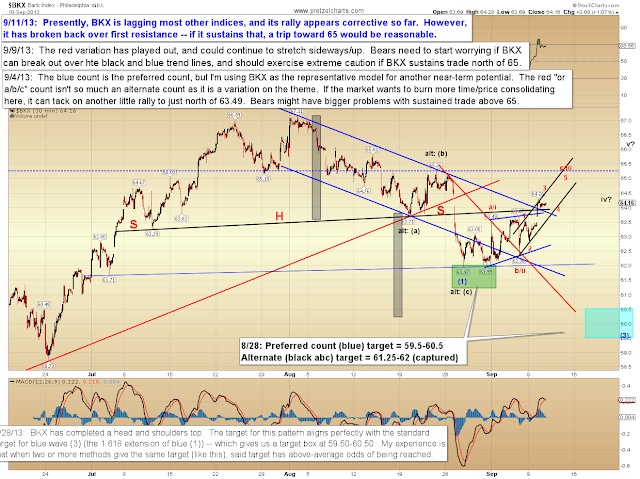 BKX is lagging the current SPX rally by a small margin, so I think it's wise to observe whether that continues. Plus this stuff makes a great ice-breaker! SPX looks like it may do some backing and filling, but the pattern suggests it will chop higher over the next few sessions. The big inflection point will come when it's formed a cleaner ABC rally. I'm presently leaning toward the bears winning the battle at that next inflection point, but the market's picture has definitely changed somewhat with this week's breakout. I would be remiss not to make mention of today being 9/11, though I'm unable to think of much to say which wouldn't come off as sounding trite. I'll simply keep those of you who lost loved ones in my thoughts and prayers today. In conclusion, bulls have reclaimed the first important resistance levels, and the pattern suggests further upside bias over the near-term. A test of the 1695-1700 zone looks reasonably likely, and from there, I'm presently modestly inclined to favor the bears will take over. 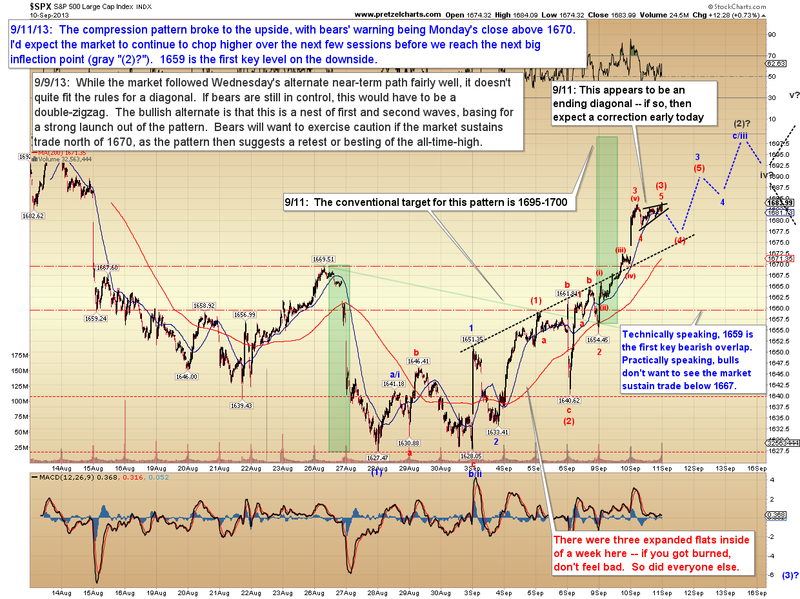 The market reserves the right to change my mind, so we'll see how the pattern looks over the next few sessions. Trade safe. 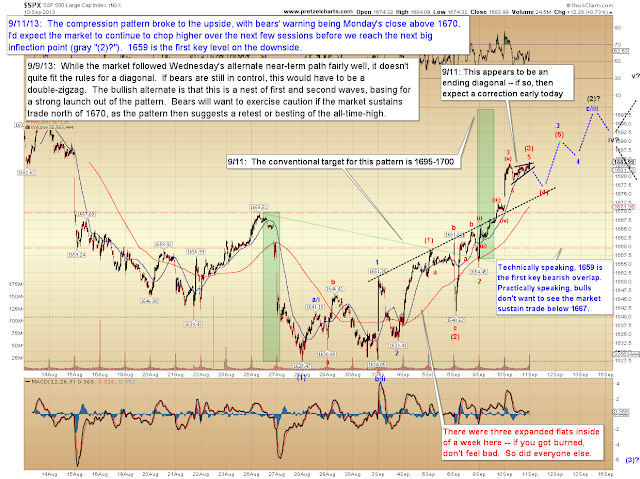 Looking at the price action of the SP500, it 's easy to see that the bulls are back again ! Seeing the price climbing higher each day I can just hear the muted roar "buy... buy". It wouldn't surprise me one bit if this keeps going to the 1730-50 zone. Maybe this September will be good for the market.